The strongest support for a pathway to citizenship came from Hispanic Catholics, Hispanics Protestants and black Protestants. 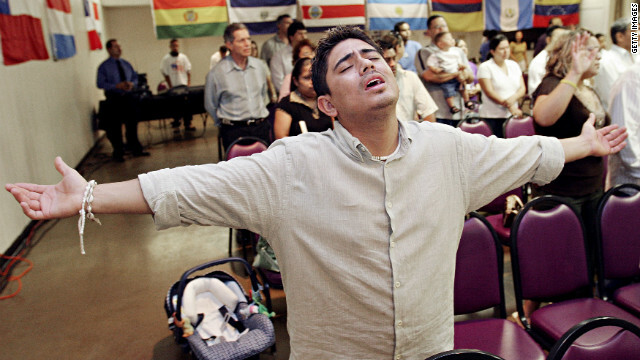 Washington (CNN) – A majority of all major religious groups in the United States, according to a survey released Thursday, support a pathway to citizenship for illegal immigrants currently living in the country. From American Jews to Mormons, from Catholics to white evangelical Christians, Robert P. Jones, the CEO of Public Religion Research Institute, said the overwhelming support for a pathway to citizenship has been growing in the last few years and is a noticeable reason many in Congress are warming to the idea. The strongest support for a pathway to citizenship came from Hispanic Catholics, Hispanics Protestants and black Protestants, according to the poll. More than 70 percent of people who identified with those groups supported the immigration change. Additionally, more than half of all Jewish Americans (67%), Mormons (63%), white Catholics (62%), white mainline Protestants (61%) and white evangelical Protestants (56%) supported the inclusive immigration policy. “Having all of the groups on one side of this debate is pretty remarkable,” said Jones. While Congress’ schedule has been jam packed in 2013, immigration reform has remained a top priority. A group of eight senators has attempted to forge a compromise on the contentious issue and a number of high-profile Republicans who once were tepid about a pathway to citizenship have announced their support. Just this week Republican Sen. Rand Paul of Kentucky and Republican Rep. Raul Labrador of Idaho came out in support of the policy. “What I think should happen is anyone who is here illegally can come out of the shadows, become legalized in some way, have some legal status, and that status could lead to legal permanent residency and citizenship eventually, but just the same as anybody else who falls into that category,” Labrador told reporters on Wednesday. Many Republicans have pegged their support of a pathway to citizenship to first securing the nation’s borders. "I think the conversation needs to start by acknowledging that we aren't going to deport 12 million illegal immigrants," Paul said in an interview with CNN on Tuesday. Religious Americans, more than most groups, have been supportive of immigration reform in the past. Though some movement has been experienced in the last year, Jones said the support that is now being seen for immigration reform on Capitol Hill is primarily because lawmakers are beginning to realize most Americans support an immigration fix. Overall, the poll found that more than 6-in-10 (63%) of Americans said the immigration system should allow a conditional pathway to citizenship for immigrants who came hear illegally. Although more Democrats (71%) were more supportive, a majority of both Independents (64%) and Republicans (53%) favored Congress initiating a pathway to citizenship. According to Jones, morals and values are generally the reason that religious Americans were in favor of immigration reform before a great deal of the country. Jones said in interviews for the poll the idea of the Golden Rule, of treating others how you would like to be treated, was an idea that was brought up regularly. Treating immigration as a moral issue, instead of solely a policy issue, is an argument that religious organizations have long used while lobbying congress for reform. In January, members of the Evangelical Immigration Table told CNN that a primary argument they are making to the White House and Congress is immigration form needs to be a priority because it is a moral imperative. In addition, religious leaders, particularly Christians, saw the 2012 election, where Republican presidential nominee Mitt Romney struggled mightily among Hispanic voters, as the tipping point for reform. Richard Land, president of the Ethics and Religious Liberty Commission who has long counseled Republican presidents on religious issues, told CNN in January that the 2012 election showed the Republican Party that without the Latino vote, the future was bleak. According to the poll, most Americans agree with Land. Forty-five percent of all respondents said the Republican Party’s stance on immigration hurt them in the 2012 election. The telephone poll of 4,500 adults was conducted from March 6, 2013 to March 10, 2013. It has a margin of error of plus or minus 3.1 percent. Were you aware that your blog is coming up with issues in Opera? I had to open Internet explorer to finish reading. look at that. I'm sure it's costing you a number of visitors. Obviously, the cheap labor pool is currently filled with illegal aliens. Soon it will be filled with robots and computer-controlled machines i.e. do not make matters worse by granting citizenship to 11 million illegal aliens who will not be employable. Those who deny freedom of speech are not worthy of freedom of speech! Who is denying freedom of speech? And everyone is entitled to freedom of speech whether or not you agree with them. 1 Law a published false statement that is damaging to a person's reputation; a written defamation. If people want to say things that damage other people's reputations, then they better be prepared to defend their opinion, or shut up.